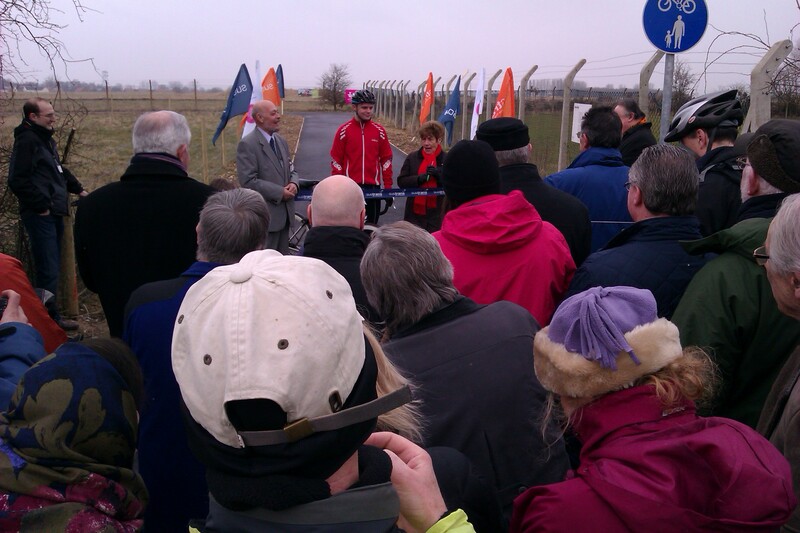 This morning I attended the official opening of the new Watton–Griston Cycle Track, one of the new links created as part of the Sustrans Connect2 Scheme. The new cycle track mostly follows the route of the old Watton–Griston road, which was stopped up in the 1930s to make way for RAF Watton. 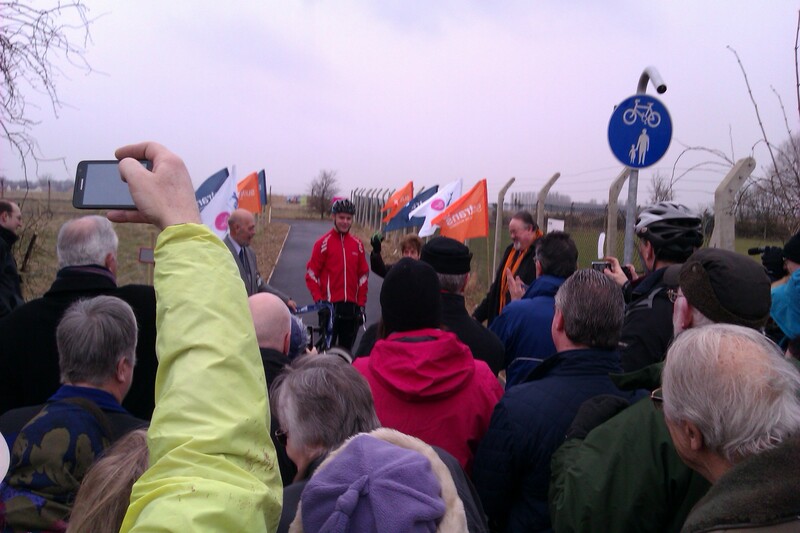 The airfield closed a few years ago, and Sustrans has worked with Norfolk County Council to build the cycle route. The new cycle path is called “Stans Walk”, in memory of a local resident who campaigned for the route. 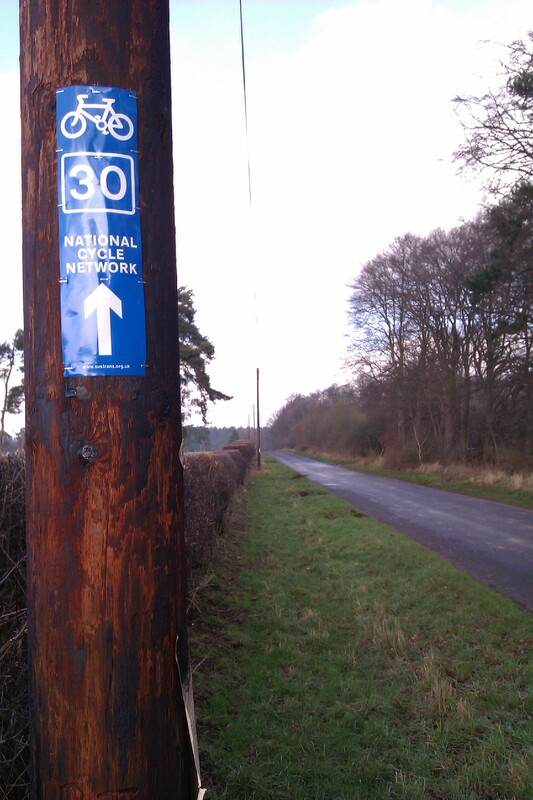 I set off from Thetford on my bike, following NCN 13 north, to the village of Thompson. The section along the Peddars’ Way was a bit bumpy, but was generally fine apart from one section that was flooded. I was able to get around the side ok though. 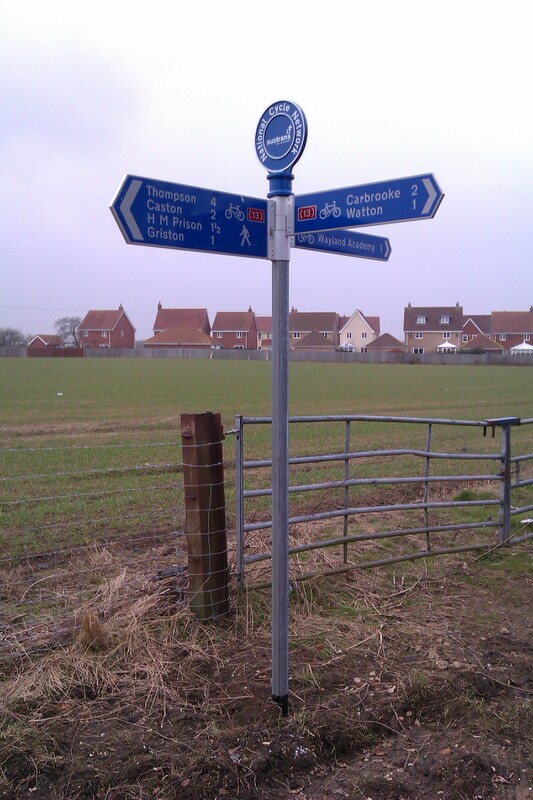 I then followed the Thompson–Griston road to get to Griston, noting several new Sustrans “(13)” link signs along the way. At Griston, we met up at the Manorcourt Day Centre for some speeches, and then Gillian Shephard cut the ribbon to officially open the route. 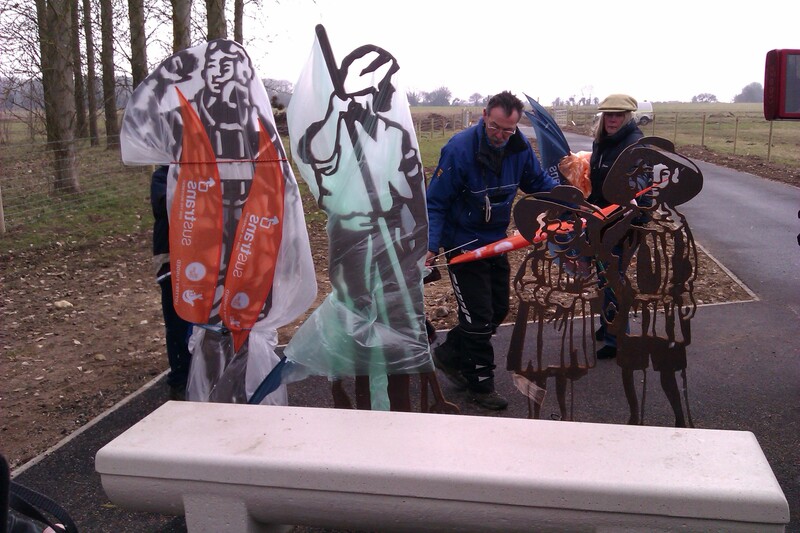 We also walked out to the middle of the route for the unveiling of the new Sustrans Portrait Bench. The local figures depicted here are an Airman, a Farmer, and the Babes in the Wood. After the official stuff was over, I cycled the rest of the route into Watton to collect a GPS track, so I could add the route on OpenStreetMap. The turnout for the opening was very good, especially considering the poor weather (only just above freezing, and intermittent light snow flurries.) The cycle there was quite hard work, and I was glad of a lift back in the car. Update (2013-03-06): CycleStreets.net has now imported the data for the new route from OpenStreetMap, so it is used if you plan a route between Griston and Watton. 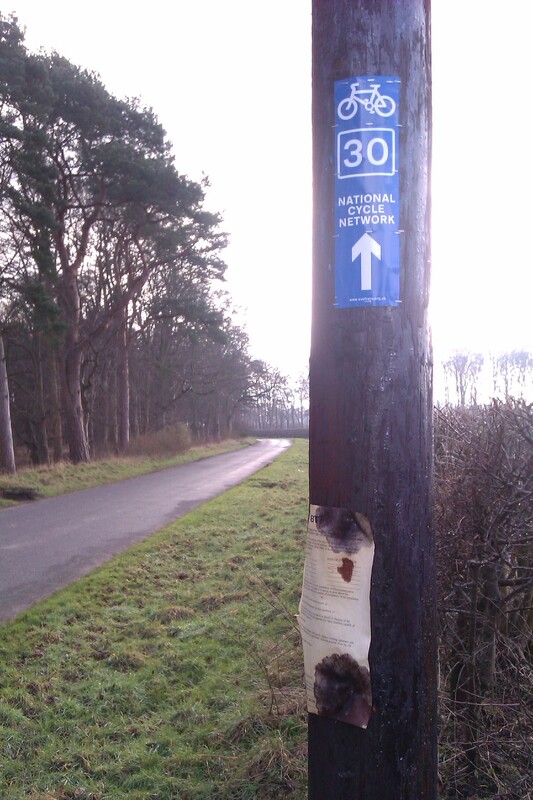 There were no other problems with the route or the signage.